Davis Off Road Has Been Customizing Trucks for Over 30 Years! Davis Offroad has built and worked on thousands of custom trucks - from custom bumpers all the way to a hand-built suspension systems constructed here in-house. You can find such projects at your local rock crawling trail or gracing the cover of 8-LUG magazine. Mild to wild Davis Offroad can handle all of your needs. 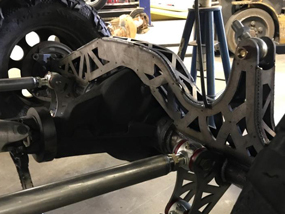 If a simple bolt on product or kit wont suffice for you - Straight axle conversions, complete 4-link suspensions, tube bumpers, roll cages, ladder bars, spring hangers, track bar setups, and shock mounts are just a few of the things you will see being made in house here at Davis Offroad. Obviously custom fabrication will not be as cheap as a bolt on kit, but in many cases it is the only way to get you exactly what you want on your project. To request a quote on a custom build we need you to be very specific when describing your vision- so we can be as realistic as possible with a ball park quote on your unique project. If you want to stand out in the crowd or just go that extra notch above the norm this is the place for you!